As the indoor track and field season reaches its climactic end this weekend with the NCAA Div. III National Championships, the men’s track team is poised for a strong showing on the national stage. Tufts competed in two of its final indoor meets this weekend. The first was at home on Friday for the Tufts Final Qualifying Meet, and the second was at Boston University on Saturday for the IC4A Championships. At both meets, multiple Jumbos ran season-best times and several more put up qualifying times for nationals, raising the total of Jumbos competing this weekend at Grinnell College in Iowa. In the IC4A Championships at BU, the only group in action for Tufts was the 4×400 meter relay team, consisting of sophomore Andrew DiMaiti, senior tri-captain Alex Kasemir, junior Nick Usoff and senior Veer Bhalla. The foursome ran a season-best time in the 4×4, clocking in at 3:16.75, which was converted to 3:19.90 because of BU’s banked track. Although the time was the best on the season for the Jumbos, it came up just short of qualifying the team for the national championships. Kasemir and Bhalla have already qualified individually for nationals, though, with Kasemir competing as part of the distance medley relay team and Bhalla seeded sixth nationally in the 800 meters. Kasemir’s distance medley relay team in fact turned in one of the Jumbos’ few nationals-worthy performances at the Tufts Final Qualifying Meet on Friday. 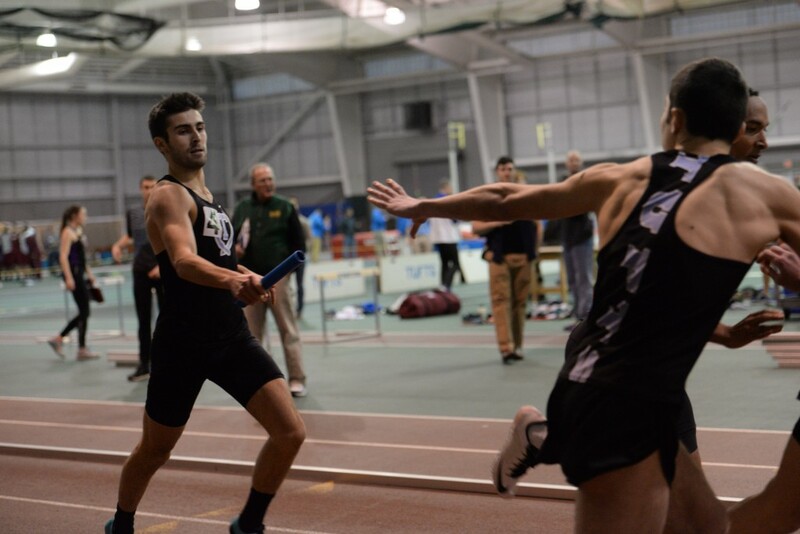 The team of first-year Colin Raposo, senior Alex Apostolides, senior tri-captain Mitchell Black and Kasemir ran a time of 10:02.51, which will qualify the four of them for the DMR at nationals. Senior Bryson Hoover-Hankerson finished his indoor track career at the Last Chance Meet by setting a new school record in the 60-meter dash, shaving 0.03 seconds off of his time of the previous school record of 7.07 seconds that he set earlier in the season to establish the new record of 7.04. Despite the impressive feat, Hoover-Hankerson was unable to qualify for nationals this weekend and will now look to prepare for the outdoor track season. In addition to Black, Bhalla, Kasemir, Apostolides and Raposo, juniors Tim Nichols and Luke O’Connor will also compete at Grinnell this weekend. Nichols and O’Connor, both cross country stars who competed in the cross country NCAA national championships last fall, are competing in the 5,000 meter race at their first track national championships. Undoubtedly the most qualified and most competitive Jumbo heading to Iowa is Black, an eight-time All-American who has competed at every indoor and outdoor track national championship in his four years at Tufts. In addition to leading Tufts’ DMR team, Black will compete alongside Bhalla in the 800 meters, the event in which the tri-captain and All-American is the defending national champion. Senior James Traester is also heading to Iowa with the team and will serve as the alternate in the DMR. The Jumbos have high hopes heading into this weekend as the seven of them competing represent the most the team has sent to a national championship since the 2012-2013 season, when they finished 15th as a team. Tufts finished 14th in 2014 and 15th last year, though they are set to turn in their strongest showing in years and beat 16 points, the most the team has ever received at nationals. The Jumbos are already in Iowa and will begin competing at Grinnell tomorrow and finish the meet on Saturday. Whatever the results are at nationals, the Jumbos can take pride in their indoor season. The Jumbos have fought hard, and already turned in one of their strongest seasons in years. They will look to cap off the indoor season with a strong showing at nationals before moving on to the outdoor season this spring.